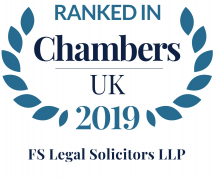 FS Legal Solicitors LLP (FS Legal) is a specialist firm of lawyers focused on advising clients in commercial business and private investment. We were ranked as Leading Firm with our Lawyers being recognised as Leaders in their Field by both Legal 500 and Chambers & Partners. As a successful award-winning firm our priority has always been the long-term well-being of our clients above all else. We have offices in Birmingham and Manchester.